Welcome to the third NCAA Team of the Week for the 2018 season. As always, our team of over 500 analysts has dissected and graded every snap of every game to bring you the most detailed and valid set of picks you can find anywhere. With some conferences starting conference play, the Week 3 Team of the Week saw many impressive performances across the country but even with conference foes facing off, playing time and the quality of opposition have been factored in to make these selections. 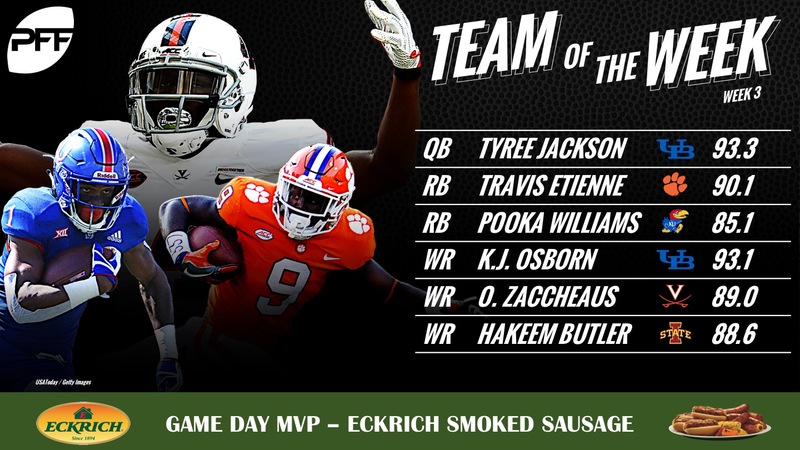 The PFF Team of the Week is brought to you by Eckrich, the Official Smoked Sausage of the College Football Playoff. Jackson and the Bulls offense were seemingly unstoppable against Eastern Michigan on Saturday. Completing 23-of-29 passes, Jackson uncorked five big-time throws while also not making a single turnover-worthy play. He connected on 4-of-9 deep shots (20-plus yards) for 217 yards and two touchdowns as one of the nation’s premier deep-pass throwers was at it again in a game much more reminiscent of what we came to expect from Jackson a season ago. Etienne turned 16 carries into 162 yards and two touchdowns as he forced five missed tackles and gained 58 yards after contact. For the afternoon, 63.6 percent of Etienne’s carries went for either a touchdown or a first down. The nation’s highest-graded running back through three weeks, Williams Jr. was at it again, this time propelling Kansas to their first back-to-back set of wins against FBS opponents this decade. Williams bullied his way to 169 yards on the ground including a touchdown, five runs for first downs and six missed tackles forced on the ground. Osborn was the biggest beneficiary of Jackson’s great game in upstate New York, hauling in 7-of-7 targets for three touchdowns and 188 yards. He did some of the heavy lifting himself as well, recording 95 yards after the catch and forcing an additional three missed tackles. In a game moved to Nashville due to Hurricane Florence, Zaccheaus could seemingly do no wrong. He turned 10 targets into nine receptions for 247 yards, two touchdowns, two missed tackles forced and a national-best 176 yards after the catch. All told, he joins Osborn with a perfect passer rating of 158.3 when targeted as he broke the UVA record for receiving yards in a game. Doing his best in a losing effort, Butler was a one-man wrecking crew with the ball in his hands. Racking up 82 yards after the catch, he forced five missed tackles and recorded one of the nation’s best plays not only of this past weekend but of the entire 2018 season to date. Pinkney had himself quite the afternoon, albeit in a losing effort to Notre Dame. He hauled in all five of his targets for 111 yards and a touchdown as well as four additional first downs. Rounding out his afternoon, he didn’t allow a pressure on his limited pass-blocking snaps and had an above-average run-blocking grade for the Commodores. From his right tackle spot, Taylor mauled the Colorado State defensive line all game long. He didn’t allow a single QB pressure on 17 pass-blocking snaps while Gator running backs saw great success rushing to either side of the 6-foot-5, 328-pounder. Williams finished with a clean sheet in pass protection but was dominant as a run-blocker in Mississippi State’s inside-zone heavy run scheme. On carries to either side of Williams, Bulldog running backs averaged 9.6 yards per carry, gaining 134 yards on just 14 attempts. The nation’s highest-graded overall offensive player is the third Buffalo Bull on this list as O’Hagan continuously won his 1-on-1 matchups against Eastern Michigan. Combining a clean slate in pass protection with the highest single-game run-blocking grade (92.6) we’ve given to a center in 2018, and you have one impressive performance from the Bulls center. Another SEC lineman to keep a clean sheet in pass protection, Cleveland logged 26 pass-blocking snaps without allowing a single pressure. So far in 2018, Cleveland has yet to allow a QB pressure on his 52 snaps in pass protection. In perhaps the weekend’s most dominant pass-blocking performance, Dillard logged 71 snaps in pass protection, giving up just a single QB hit. For the season, he’s now allowed just three total QB pressures on a whopping 193 pass-blocking snaps, something we’ve become accustomed to over his four-year career in Pullman. Once again a menace to an opposing offensive line, Jelks was too much to handle for San Jose State on Saturday night. He finished the game with five total QB pressures including three QB hits that forced SJSU QB Josh Love to average just 2.29 seconds per attempt. Like Jelks, Polite constantly got to the quarterback on Saturday, recording five total pressures including one sack and four additional hurries. Had it not been for two missed tackles, his overall grade would have been much higher, buoyed by a forced fumble and two stops for an offensive failure in Florida’s blowout win over Colorado State. Ole Miss couldn’t stop Alabama and that was no more apparent than Williams’ impressive display from the interior of the Crimson Tide defensive line. He got home to the count of three QB pressures but more impressively, on 19 snaps in run defense, Williams recorded five run stops for an offensive failure. His 26.3 run-stop percentage was by far the highest of the day at the position. From one of the more athletic plays you’ll see from an interior defensive lineman all season long when he intercepted a Shawn Robinson shovel pass and juked his way into the end zone to his utter dominance up front, Jones put forth quite the effort in Ohio State’s victory over TCU. He may have only gotten home with one sack but Jones constantly won his 1-on-1 pass-rushing matchups to the tune of a 15.8 percent pass-rush win percentage. An all-around performance for the ages, North Texas knocked off Arkansas as Ejiya’s defensive effort went a long way in the upset. Ejiya produced as a pass-rusher (5 total QB pressures), as a run-defender (3 run stops) and in coverage (1 reception, 3 yards allowed). 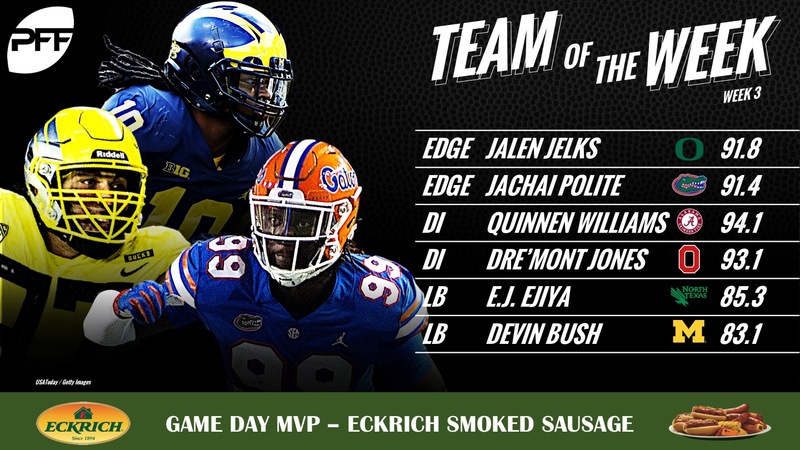 Bush flew all over the field for Michigan on Saturday, leading the Wolverines with his 83.1 overall grade and his 79.4 coverage grade. He recorded three pressures on just nine pass-rushes, five defensive stops while allowing just six yards in coverage all without missing a tackle. Thompson makes this list by means of his prowess in coverage on the afternoon despite missing two tackles against Texas State. On five targeted passes, Thompson did not allow a single reception and brought home two interceptions and an additional pass breakup for a 0.0 passer rating when targeted. What more to say about Baker after his ridiculous start to the 2018 season after being selected as our top cornerback for this season. Against Middle Tennessee State, Baker was targeted three times and allowed two receptions but limited MTSU to negative yards on those receptions. He tallied another interception to give him two on the season in addition to two more pass breakups as he’s allowed a passer rating of 33.7 on throws into his coverage this season. Impossible to break up the safety duo at Alabama after their dismantling of Ole Miss as they’ve each earned a spot here. Thompson had the more impactful day of the duo, coming down with an interception, a forced fumble and an additional defensive stop while McKinney recorded an interception of his own and a QB hurry on a blitz. Similar to the Alabama safeties, it was impossible to break up the Kansas duo as the four players from Kansas and Alabama combined to finish the day with four of the five highest grades at their position. Lee was targeted twice as the primary defender in coverage, not allowing a single catch and bringing in an interception. Torneden also came away with an interception while he had the bigger impact in run defense, recording four total tackles and a run stop in the process. Much of the success for the Huskies in their victory over Utah on Saturday night can be attributed to their secondary as they limited the Utes to just 136 yards passing on 39 attempts. Murphy was targeted eight times yet allowed just three receptions for a minuscule seven yards. Topping it off, he forced four incompletions to lead the nation’s cornerbacks in Week 3.